Whether they set the mood, deliver sentiments not carried across in dialogue, or accentuate certain themes within a show, anime songs work to add value to a show. What may get overlooked, however, is that the reverse also applies: anime also add value to their respective OP and ED themes. And I’m not talking commercial value. (That may be topic for another day.) The element that arguably propels a merely enjoyable anisong into something great comes from how intimately the song is tied to the anime. Spoilers to follow for Natsume Yuujinchou, Steins;Gate, and Puella Magi Madoka Magica. Very often, the anime ties the lyrical aspects of a song to a context, allowing us to form a mental picture as we listen. This cannot be more clearly articulated than in Natsume Yuujinchou’s first ending, “Natsu Yuuzora”. No doubt a gem on its own, the additional connection with the anime brings to life the imageries within the lyrics, particularly the association with summer (evident in the song title). Lines like “the scent of summer”, “the voices of my friends”, and how “even now, my heart smiles when I look back on that summer day” are more than just nostalgia. 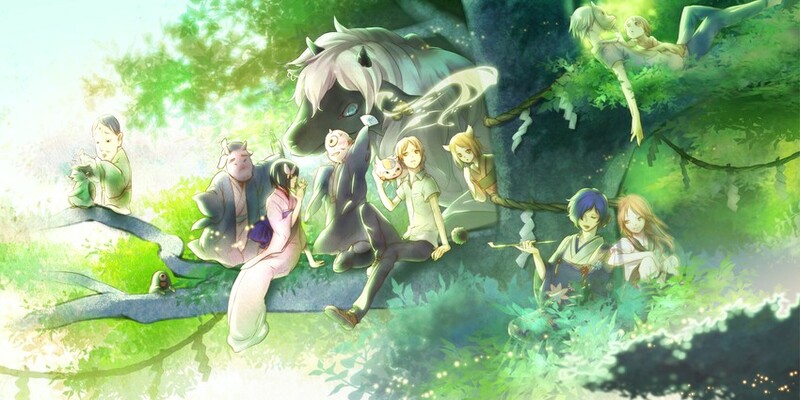 To someone who has watched the anime, they are heartwarming, conjuring up the many images of the time Natsume spends with his dear friends (human or otherwise), friends who mean the world to him after the loneliness and fear he went through in his childhood. And when you listen to “Natsu Yuuzora” after every single episode, the anime’s lingering feelings of warmth and friendship percolate into “Natsu Yuuzora”, making it more satisfying a listening experience. Another choice example would be “Hacking to the Gate”, with its lyrics focusing on the overarching theme of the anime: time. The lyrics go further by helping us relive significant moments in the anime itself. Personally, the most impactful moment in the show was when Okabe acknowledged that he no longer felt any emotions when Mayuri dies, a sentiment that painfully depicts his helplessness. The lyrics closely mirror this by describing how one is repeatedly swept into the unfeeling loop of time as a lonely observer. The anime thereby allows us to tie lyrical references closely to the plot, giving the lyrics far more meaning compared to a standalone listen. Beyond lyrical references, an anime can also add meaning to the musical progression and instrumentation of a song, which is arguably story-telling at its best. And for this, we turn to Puella Magi Madoka Magica’s “Magia”. Starting with the eerie chorus which sets the tone for the forlorn story about to unfold, the subtle entrance of the low cello notes depict how one is unknowingly sinking deeper into the darkness. Later, the entry of the tubular bells depicts the rendezvous with fate. For a while, the main melody and that of the bells move in unison, almost as if fate were bending to someone’s will. Before long, however, the bells take over, and swiftly move the melody back to its opening stanza, just like what happens in the anime. Also interesting is how the lyrical aspect isn’t ignored, and reflects the deep irony in the anime itself. The stanza which speaks of courage and yearning, for instance, is accompanied by the dark cello line, which hints at how attempts to realise a wish only brings one deeper into the spiral of darkness. In the last stanza of the full version, the lyrics speak of how an ancient magic has assured one that she has the power to change the world, yet the violin melody accompanying that stanza is deeply ominous and sinister, seemingly suggesting that nothing comes without a price. And with all that, I have probably done enough damage spoiling three awesome shows for those who have yet to watch it and foolishly chose to ignore my warnings. But for those who have, the imageries and parallels are deeply intriguing, and really remind us of how our appreciation of any anime song may not be complete until we have watched the series it accompanies. Immediately thought of Madoka when I saw the post title. However, for a slightly different reason: how the ED’s (and OP, too) lyrics’ meaning changes as the show progresses. Homura is mostly a side character for most of the show. In speculating, many people assumed the OP’s lyrics were describing Madoka and her friendship with QB, and were largely struggling to apply the ED’s lyrics to Madoka’s life. Only after episode 10 did we (or at least, I) see the lyrics were actually for Homura. It feels to me less of the lyrics changing its meaning altogether and more of how we as viewers can finally interpret it fully. I listened to Magia before I watched the anime, and I must say that the lyrics stood out to me as being a little at odds with the instrumentals. Only after I watched the show did I realise that it was all intentional, and meaningful. when you mentioned madoka Magica I’m really surprised that you didn’t use connect as the example of how the anime added extra meaning to the song and its lyrics, especially the context in the last few episodes. It was the reason why I prefer it than magia even though the ED is better musically. The fact that the episodes brought several whole different meaning to the sing is what makes it so fantastic. The reason is precisely that: the ED is better musically. What I really wanted to demonstrate is how an anime can add meaning to the melody and instrumentation of a song. While Connect’s lyrics definitely fit the story of the anime, I can’t see Magia’s level of attention and detail put into the melody. Another thing to note that might have affected matters is that “Connect” disguises itself pretty well. From the lyrics, you do get the feeling that it just might be the normal high school girls’ anxiety that the lyrics discuss and it’s not really made clear until halfway through that the general theme is more applicable to Madoka’s situation. That, and the animation is certainly a good troll and is a bit of a mood whiplash from the anime’s darker tones. Looking through my list of anime seen, I’d say Honey and Clover’s “Waltz” comes to mind as one that feels enhanced after viewing each episode because the moods many of the episodes capture the bittersweet feelings of love in the anime and linger off of that. The music from ARIA also complement each other well. I think Mina Kubota specifically composed OPs like “Undine” specifically for the show and the serene ripplings go a long way in depicting the show’s atmosphere and pacing. Another thought: EDs might be better at this than OP themes because ED themes are meant to linger onwards sorta. And if you want a song to have a good impact by letting the anime dictate the flow, it’s best to stick those kinds of tracks towards the end. And yea, that’s an interesting point. A lot of time, the ED theme is also the one used to accompany any flashbacks at the end of a story arc or an anime, so that would help viewers draw the link between the show and the song as well. This is a really well written article. Its a pity that it wasn’t long. I wish you could have given more examples to illustrate your piece. I loved the Natsume and Steins examples. Natsume in particular because its more emotionally stimulating. I deliberately used to skip the ending sometimes after a melancholic episode because the song would just make me more sad. And you’re so right about the lyrical references the opening songs make sometimes– they become more relevant with each passing episode as the true meaning of the song unravels. It is difficult to come up with similar examples because they’re a little rare. Most anime would just rather show the whole anime in their openings giving away important plot points. Natsume Yuujinchou does have an excellent record for ED songs. Can’t say the same for the OP, but I’ve enjoyed every single one of the ED songs to date. Songs which make more sense as the anime progresses are quite rare. Off the top of my head, I can only think of a few. Uninstall by Ishikawa Chiaki (Bokurano) is one of the best, albeit a bit dated. Transparent by KOKIA (Phantom: Requiem for the Phantom) also makes a lot more sense as the story goes on, and seems to be told from Ein’s perspective. More recently, Manten by Kalafina (Fate Zero) is quite good in that aspect too. However, I must admit that it is easier to achieve this with Kalafina, because Kajiura quite frequently composes for the series their songs accompany. This makes it much easier to tie lyrics and melody to the narrative and musical themes in the anime.